Our Photo Album contains some images of work we have done. We will try our best to get back to you within 24 hrs. Kindly include your vehicle information such as year, make, model, state and zip code, etc., and what it is you are interested in, or needing. Note: Zip Code is required when needing a quote on shipping. You can also call us at our toll-free at 1-877-HITCH-IT (448-2448). We take pride in our customer service, and will help you to the best of our ability. Thank you for taking the time to visit us at www.drawtite.com. Jim from NC wrote - "I just wanted to letyou know I was very pleased with the efficiency and operational ease while placing an order on your website. I especially liked the UPS confirmation notification and tracking feature. In the future I will certainly recommend your company to others. Thanks for making my shipping experience simple and enjoyable. Keep up the good work." Erich wrote - "Dana, I received the hitch yesterday (wow, quick delivery) and installed today. It took less time to install then it did to go to the store and buy a 18mm socket that I didn't have. No issues...looks great. Thanks for your support and a great product at a competitive price." John wrote - "Unfortunately, I do not recall the name of the woman who called the morning after I placed the order; but, we sincerely appreciated the call. She noted that one of the items (a Tj-one connector for a 2007 Jeep Liberty) did not go with the other items I had ordered for a 2006 Camry and called to confirm that the item was what I intended to order. (it was as I ordered that part for my father's Jeep.) She also confirmed that the 6-pin round connector was appropriate for our installation. This is excellent customer service! Thanks for a job well done!!" Jim wrote - "I would just like to send a quick e-mail to say "Thank You!". I just got off the phone with one of your sales reps.I placed an order over the internet Sunday night. I was willing to pay 3 day select shipping. I am leaving this weekend, so I really needed the part. The lady I spoke with (I do not remember her name) told me that she changed the shipping to a lower price because she could ship it from a closer warehouse and saved me money. It is not often that in this day and age that you find good people who look out for not only the companies best interest, but also those of their customers. Even though I just bought a small part, I will be using your company again and I will be telling others. This made my day. i am glad that you employ people that care. Thank you again!!!" Troy writes - "Hello, I recently purchased a trailer wiring harness from your organization. I'm writing to express my appreciation for Dana, the customer service representative who helped me on the phone. I was not certain in my product selection and therefore contacted your customer service line. Dana took significant time, asked many questions, and consulted with others to help me identify the correct part and she also rushed the order to ensure I received the item the next day. I received the product and it worked perfectly. I hope you will recognize Dana for her great attitude and customer service." Jerry wrote - "Great install. I let my 12 year old son do it while I held the light for him for a change. He was done in 15 minutes!" Mike wrote - "I received my parts yesterday. I also received the catalog you sent with the drawings and parts breakdown. Thank you very much for sending the catalog, this is a perfect example of outstanding customer service, exceeding the expectation of the customer. I suggest you send this to your manager, I would have if I knew how. Thanks again and in the future you can expect I will be contacting your company for my hitch needs. Dana, I want to "Thank You" for going out of your way to help a customer in need. Your location was not the point of sale for this customer, however you treated it as it was your own. I personally want to Thank You and the Plattsburgh Spring Team for a job "Well Done". Greg writes: "Melanie - Great Service!!!!! Delivered today at 3:37PM. Dave wrote: "Man!! What a quick reply - Drawtite rocks! Unfortunately, I don't have a vehicle to put this on. But based on your customer service, when I'm ready to buy a hitch I promise it will be a Drawtite. Thanx!!" John W. from MO wrote: "Your website was very easy to navigate and find (and order!) what I needed. Thanx." need to search separate states for requirements, different mfgrs for components ...etc. Much Appreciated!" Dave Writes: "I Received the fax for directions today! Thank you for such prompt and courteous turn around time for my request!" Stacey in Ontario says: "I found your site this morning; it looks very clean and professional"
Darlene E. wrote: "Kevin, I'm very thankful to you, Melanie, and Brad for all that you did to get us on the road - but more importantly, safely on the road for our Memorial weekend camping trip. Individually you were very courteous and professional and together your teamwork impressed me. I especially appreciate your gentle ways of reminding/educating me about the importance of preventative maintenance. I expect I'll remember the service I received for a long time, and will highly recommend your business". Theng wrote in an e-mail "What a great site! Thank You!" Lee F. in VA says: "Dana, thanks for all of your help with my order. The order was received with absolutely no problems - a great fit and an easy job. You definitely made the process quick an easy, and I've already told a friend of mine to give you guys a call. Thanks Again!" Rob H. in Nashville says" "I'll check it out and then place my order for one. Many thanks for the prompt reply and great service!" 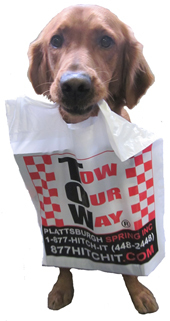 Blake J. in NY says: "Plattsburgh Spring Inc. has probably the most informative and well organized site of the several dozen that I have viewed while searching the web. Thank you for your help and we will be awaiting your timely response as we are anxious to start using our trailer." Mike A. says: "I ordered a trailer hitch for my new truck from you primarily because of your detailed email response to my initial inquiry for a hitch. Due to your excellent customer service I bought from you. The hitch fit perfectly-as promised- so you have one extremely satisfied customer! Thank you for total excellence in customer service. Great job guys and gals!" Virginia in Germany says: "Ya'll are AWESOME...you did what no one else could do. Thanks for helping us meet our mission requirements." Larry M. in MD says: "I have ordered a Draw-Tite hitch and wiring harness today and the woman who answered the phone was very helpful and courteous. Thanks for all of the help today and I look forward to receiving my product later this week." Michael G. in GA says: "Thank you! My experience working with you guys couldn't have been better." Bill R. in MD says: "Just wanted to compliment you on your informative and will designed website. I have book marked it for future reference...It has a lot of good information on your products." Michael from Connecticut says: "I am happy to pay a little more money to do business with Plattsburgh Spring, Inc. I am so pleased to cancel my order with the other company because the remark from customer service was unacceptable. You are awesome girl(Stephenie). Tell your boss I approved your raise for great customer service :)." Jerry S. says: "Really can't let you know how much I appreciate the time and trouble you went through to locate the hitch for our 66' plymouth belvedere II convertible. It definitely will get a lot of use---maybe even pulling the motorcycle trailer. We will think fondly of you every time we use it." Jim Y. in CO says: "Thanks Stephenie for your excellent service on my order for a hitch and t-one connector. It is a pleasure to do business with folk who do what they say they will do. Thanks again." John M. says: "Thank you for your quick reply. The information you provided was very helpful." Barb F. in GA says: "Thank you so much for your assistance. The order is placed and it was a pleasure doing business with you." Larry W. says: "Thank you for your answer and your comments. Appreciate the fact you took the time to help me!" John in Germany says: "Thank you for all your assistance and support. I'm really happy to be your customer." Roger L. says: "Thanks for the reply. Your price on the unit was very good, and I will bookmark your page for future reference and to refer my friends to." Mike says: "Thanks for checking this for me. Nice web site and thanks for the professional note." Jim G. says: "I sincerely Thank You for your time doing this research. I appreciate your willingness to contact me when this hitch is available and the ability to receive a copy of the installation instructions prior to ordering. Thank." Chris D. in GA says: "Thank you for a speedy response to my inquiry!" carl M. in NY says: "Thank you for your time and consideration with this problem." Rich C. says: "Thanks Stephenie. Just wanted to say thanks for your help with my hitch. Everything went together smoother than silk. I past on your website to a couple of friends who are interested in a hitch for their own trucks. Again thank you very much and it was a pleasure doing business with you and the company that you work for. Thanks so much."